Fails every time on mine even with watch right next to phone, and even if I uninstall then re-install facer, even after factory reset on the watch. Only factor in common with your scenario is using an iPhone instead of android phone. Same here too. My iphone is right beside me. I even layed the watches on top of it. Lol how much closer can you get. Not sure why facer gets once in a awhile when 3 different models did it every time since the watches went from android wear to wear os. Iphone had something to do with this issue.. I wonder if it can temporarily be linked to an Android phone permitting it generate a qr code on the screen, and then that qr code scanned by the iPhone app. It would be rather circuitous, but might work to enable facer. It sounds more like facer needs to fix their iPhone app if they intend to maintain compatibility. BTW on my watch only updates to Android OS 7.0. I wonder if that limits the flexibility at all? It would be nice to have a watch that was very compatible with the IPhone without paying the exhorbitant price for an Apple Watch. Any update on this? Is the communications for the QR code via WiFi or Bluetooth? @mdhirsh We are still working with Google on this. Our test watches connected to iPhones work as expected on our side, but there's clearly a few users like you affected by this issue. The QR code generation requires an internet connection, but wether you get it directly via wifi, or proxied via bluetooth from your phone shouldn't matter (in theory at least). So. The problem is iphone with wear os. I hope that helps. Ps yes it bt and wifi was on all the devices and right beside the phone.. So it takes a gear S2 to work with the IPhone platform? Do any of the non-Apple watches seem to offer all the features/ functionality of the Apple Watch when used with the iPhone? You would think the Facer people would have tested their app for the iPhone and it’s companion apps for the different watches more thoroughly before release. Is it possible that Apple did something in their OS making it more difficult to use non-IOS watches? Its the best choice. The gear s2 lets you text and phone calls via Bluetooth or wifi with iphones. However the sport and gear s3 and new galaxy watch does NOT let you text if your using a iphone..Its disabled which is stupid. I got the gear s2 verizon variant for 60.00 on ebay. Its updated to the latest firmware. So if you dont want a apple watch boring..gear s2 even though its old is a great option. Testing the next day or so but so far its great. Also you dont have to activate the device with your service carrier. The texts and phone works via bt or wifi with you phone near by. For 60.00 great choice. Facer needs to figure why it doesnt work on wear watches if you are using iphone before I would consider buying another wear os. But facer works fine with gear s2 and iphone xs..
I’ll look into it. Other option is to give up on Facer and use Watchmaker instead. Any suggestions for rectangular face watches that might work with iPhones? Problem is apple has the os limited so bad. Your choice is the few they offer on the apple watch. You basically can only use a picture of your choice. Thats about it. That is why i so want wear os or tizen to work because if the severe limits on the the iphone. Sadly my gear s2 test is bust. The battery dies in 5 hours. Its a wonderful watch text phone calls only one that has. But to compare my apple watch series one was charged a day ago and im on hour 18 and at 32 percent. Sighhhh. So you give up cool for battery or boring for long life. Galaxy watch is great life but...no text no calls sighhhh. Hope this helps. Hey guys - just checking in again to confirm that we are monitoring this thread closely, and are continuing to try and reproduce this issue on our side. 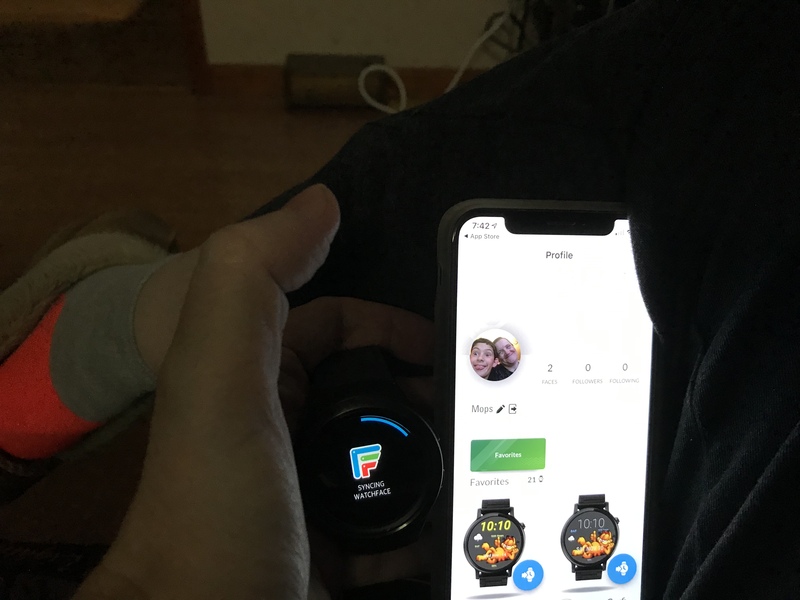 Our tests with WearOS watches connected to iPhones show no issue so far, but obviously you guys have found a scenario where it doesn't work. At this point, we suspect it's related to a combination of specific watch model, specific WearOS version, specific Google Play Services version, and connectivity with iPhone. We're continuing to try and debug this with Google and will update you when we have some more info we can share. I'm having the same problem in producing a qr code. I have a Q Explorist HR Gen 4 with wear OS 2.1. Everything up to date also. Hi @hleo! Can you confirm your watch is connected to an iPhone as well? Yes mine is connected to an iphone also. Bluetooth and wifi are both connected and working as well. Thanks @malerba.ignazio and @hleo! We're continuing to investigate this and will update this thread as soon as we have more info. Miss my Facer a lot !!!!!!! !